We all know how terrible it is to need money for an emergency and having nowhere to turn to. It is very apparent that it is becoming more and more difficult to meet ends meet and to have a scare in the family that needs money immediately or an unforeseen expense creep up on you can be extremely frustrating. We need a solution and a solution has been provided by Cash Converters through Cash Advance. Cash advance loan provides you with an immediate cash loan to guard against your valuables without having to sell them for cash. At Cash Converters you are able to claim cash on the same day at their establishment. You are able to use the service by providing them with any valuable goods from Jewellery to Electronics as collateral against your loan. Through the same day cash loan you are able to keep the things that you love and get the cash that you need within 15 minutes. Your valuable goods will be stored in a secure compartment. In one month’s time you will be expected to come back and pay the Advance Loan amount as well as interest; your valuable belongings will be returned to you just s you left them. At Cash Converters they accept valuables such as cell phones, Jewellery, TV’s and more. All you need to do is provide them with your belongings that are in good condition and your ID document. Bring in your valuables into any of their stores. A discussion of how much you need will be discussed with you. The items may be tested if need be. A price will be offered for your valuables. Once an agreement has been established you will receive the cash and your belongings will be stored. Your loan is to be paid back in one month plus interest. Your Belongings will be returned to you in the same condition. Cash Converters has another offer that is proving to be very attractive. 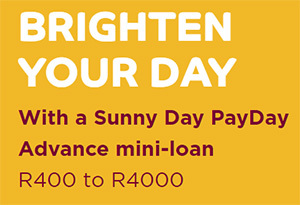 The Sunny Day 1 2 3 mini loan is a loan that offers R2 000 and is created to give you immediate help such as a payday loan. The Sunny Day loan has been created in such a manner that offers 3 easy to manage monthly payments. So you have 3 months to pay it back in full. The loan can be paid into your Cash Converters FNB VISA eWallet card and has pin protection, free point of sales swipes and they have also thrown in 1 free cash withdrawal at any FNB ATM and because Cash Converters has partnered with FNB this means you are spoilt with the eWallet transactional options such as purchasing airtime, data, electricity and more. There are no monthly fees for the card which makes it a win.